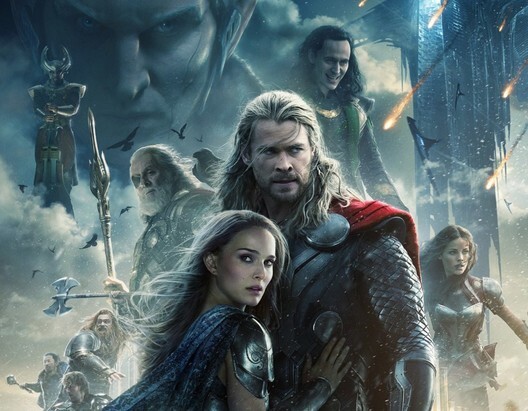 The second trailer for Marvel’s Thor – The Dark World has debuted online. This time around, we get a better look at the blonde-haired hero’s adversaries. Also, a shot of Natalie Portman’s Jane – transported from Earth to Asgard – slapping Loki (Tom Hiddleston) for all the damage he caused in New York (as seen in The Avengers). Chris Hemsworth returns as Thor. He’s joined once again by Anthony Hopkins, Rene Russo, Idris Elba, Kat Dennings, Stellan Skarsgård, and Jaimie Alexander. Christopher Eccleston is the villain, though he is not present in this teaser. Alan Taylor (Game of Thrones) takes over directorial duties from Kenneth Branagh. He replaced Patty Jenkins close to the beginning of production. It hits cinemas October 31.